While we've been fortunate enough to have a mild winter so far, the cold seasonal temperatures have finally arrived in the Columbus, Dayton and Cincinnati areas. It’s important to make sure that you keep up on some simple winter maintenance for the safety and well-being of your family and home. Add extra insulation in the attic to help trap heat in your home. Also, look for areas around doors and windows where there may be air leaking and apply weather stripping and caulk. Keep an eye on trees that have fragile or dead limbs. Trim any branches that look like they could break; this will better prevent any damage to your home. Make sure your gutters are clean and free of leaves and other debris to allow snow to melt and drain properly. Snow and ice that piles up can cause your gutters to break away from their hangers and fall to the ground. Winter is the worst season for house fires, with half of all home heating fires occurring in December, January and February. Make sure that you have properly working smoke and carbon monoxide detectors on every level of your home. 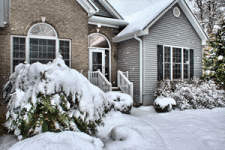 If you haven’t already, now is the time to have your furnace tune-up; this will ensure that your heating system is properly running and equipped to keep your family warm this winter season. In addition, you’ll want to make sure you change or clean your furnace filter regularly, as you may experience more build-up in your filter due to more frequent operation this time of year. Give Logan Services of Dayton, Columbus, and Cincinnati OH a call if you need furnace repair or replacement. Our team of HVAC experts can help you with all of your heating and cooling needs. Contact us today!